Colors, tints, keratins, perms, relaxers….Controlled damage to make hair look the way YOU want! Tinting, bleaching, and perming creates tiny openings in the hair through damaging hair through chemical processes involving peroxides, hydroxides, and thioglycolates. This creates spaces. When tinting, color pigment adheres onto the hair. Eventually, though, after repeated applications, your hair feels coarse and dry, due to more holes than the color can fill. Why does colored hair look so good right afterwards, and so bad later on? The chemical damage accumulates. 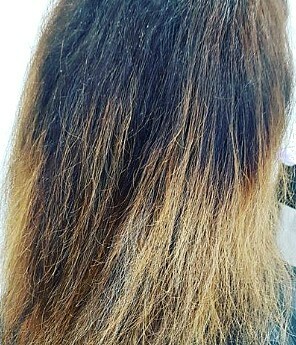 Each time the peroxide and ammonia are applied to the hair, (and don’t be fooled by ammonia free and peroxide free colors, as they have alternatively damaging chemicals) the gases cause microscopic holes in the hair fabric. The first time causes just enough for the tint to adhere, but then, each application shatters the hair just a bit more, resulting in less surface for the color molecules to hold onto. These openings leave the hair feeling rough, dry, with a dull appearance, and when it’s really damaged can make the ends look off-tone. This comes from food grade extractions – giving extraordinary shine, strength, and beauty to your hair. The small openings are filled with our natural ingredients and building blocks. Your hair responds beyond your expectations. Result? Longer, richer, & luxurious hair that others envy and admire. Take advantage of one of many “bundled packages” providing savings, free shipping in the contiguous U.S., and giving you the necessities you need now to restore/improve your hair Hair Rejuvenation Package!